The episode of violence in Patiala House Courts took a new twist with the Supreme Court today agreeing to take cognizance of a sting operation carried out by a TV channel on lawyers who allegedly assaulted Kanhaiya Kumar, arrested on charges of sedition in the JNU case. In the sting aired by India Today channel yesterday night, two lawyers, Vikram Singh Chauhan and Yashpal Singh — who allegedly thrashed journalists and students at the Patiala House Courts complex on February 15 — are purportedly seen admitting beating up JNU students’ union President Kanhaiya Kumar for around three hours when he was in police custody. Making an urgent mentioning, Prashant Bhushan, one of the petitioner in the case where a bench headed by Justice Jasti Chelameswar is issuing periodic directions on the law and order situation in the Patiala House courts , urged the bench to take suo motu notice of the sting operation and termed it “gross contempt”. “Based on sting report and the report of the National Human Rights Commission, this is not an ordinary case”, Bhushan told the bench. The bench then directed Bhushan to file a proper petition. The lawyer then said he would be doing today afternoon or tomorrow morning. It is to be seen if the Bar Council of India will also take suo motu cognizance of the sting operation and the NHRC report on the incidents at Patiala House. 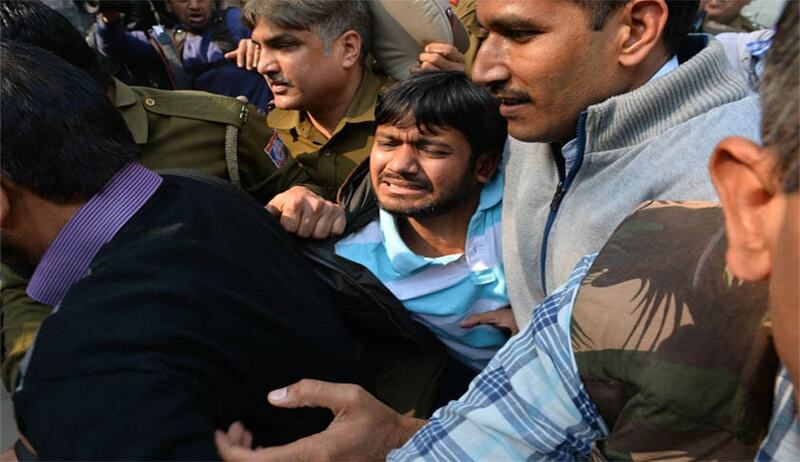 In the sting operation, the two lawyers claim Kanhaiya wet his pants during the beating. “We thrashed him for three hours and we also forced him to say ‘Bharat Mata Ki Jai’. He later raised the slogan with us and we allowed him go,” Chauhan is seen saying. Singh also said they would beat him up again. “I will get a petrol bomb no matter what case is filed against me. I will not leave him even if I am charged with murder… I want to go to the same jail and will thrash him in his cell… I will not give my bail bond. I will go to prison for one or two days,” Singh claims in the tv video. The report also pulled up Delhi Police for “serious dereliction of duty” and said it “did not do anything to prevent the assault” on Kumar inside the Patiala House Court premises Wednesday or “apprehend the attackers”. The report, which said the assault “appears to be organised and pre-planned”, has been forwarded to the Chief Justice of India (CJI), said sources. “Hon.ble members of the council appeared to be of diverse views on this issue. Some of the members were of the view that the conduct of the lawyers should be examined in the light of the background of the unfortunate incidents which took place and excess committed by any advocate cannot be overlooked”, the affidavit said adding “the council is of the unanimous view that in a democracy like India, media is one of the strong pillar and therefore any attempt on media by anybody cannot be tolerated”.